Let’s face it, stoners are some of the most health conscious people around these days and we do whatever we can to stay and be healthy. It doesn’t stop at just smoking cannabis. The stoner diet is very important. 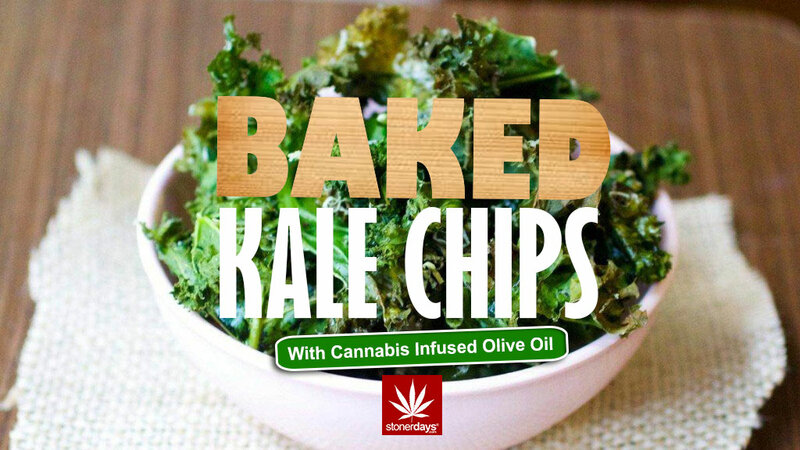 I stumbled upon this amazingly delicious recipe for baked kale chips that are not only good for your health but will get you medicated as well. Preheat your oven to 350 F and line a non insulated cookie sheet with parchment paper. Take a knife or kitchen shears and CAREFULLY remove the kale leaves from the thicker stems. Cut up the leaves in to small, chip sized pieces. The actual size of the chip is up to you. I made mine about 1 inch by 1 inch. Be sure to wash the leaves thoroughly and dry them. Some people have access to a salad spinner but for those that don’t, I used paper towels and blotted them dry. Lay the kale out on the cookie sheet and slowly pour the cannabis olive oil over the the kale chips and then sprinkles with the sea salt and pepper, as well as any other spices that you’d like to add in. Place the chips in the oven and bake them until the edges begin to turn brown, absolutely no longer than 10 minutes. Let the chips cool off for a bit and your healthy, medicated snack is ready!